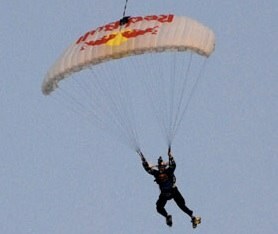 CASE CLOSED: It was Red Bull Air Force! 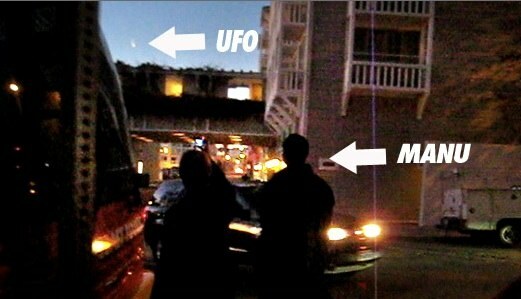 It shows Manu Ginobili of the San Antonio Spurs as he observes some kind of UFO in the sky behind him. At first it looks like the short sunlit contrail of a plane. But then it seems to be moving much too fast, even changing direction. So it’s about looking NorthWest, basically along the coast, but a bit out to sea. This is a pretty interesting video, as it shows the object change direction. If it were not for that, I’d still suspect it was a short sunlit contrail from a jet flying west. But this is clearly something else. Almost certainly closer, based on how quickly it changes direction. 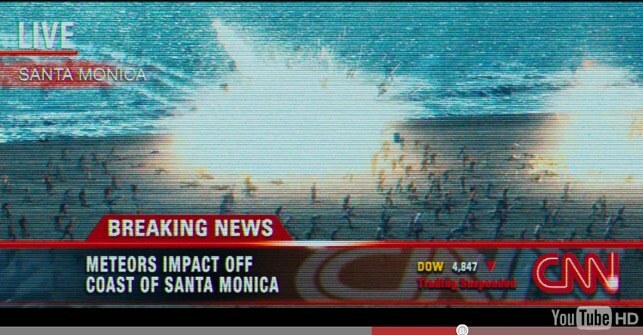 Now this video was taken at 15th and Washington Avenue, in Santa Monica. 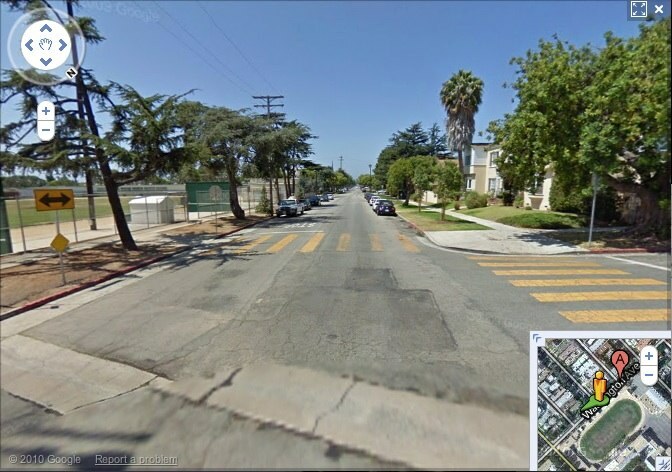 Again we can use Google street view to get a view angle (they are basically looking straight down the street). That’s somewhere over the beach, just slightly over a mile from each viewpoint, about 2/3 of a mile north of Santa Monica Pier. That also means that the object would only have been around 1,000 feet above the ground when it was videoed, so it’s not very big at all. It would also have been seen by hundreds of people on the pier. There are several more videos of this and a very similar incident a week later, they all seem to point to this approximate location and altitude. So that height seems about to match. 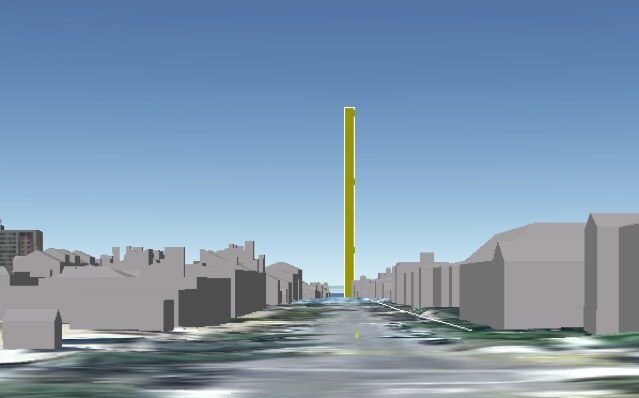 That pillar is also about 40 feet wide, now that’s much harder to judge in the video, but it seems like the object must be leaving a trail less than 40 feet long. I’d suspect much less. Making the object itself at most a few feet in diameter, possible as small as one foot in diameter. 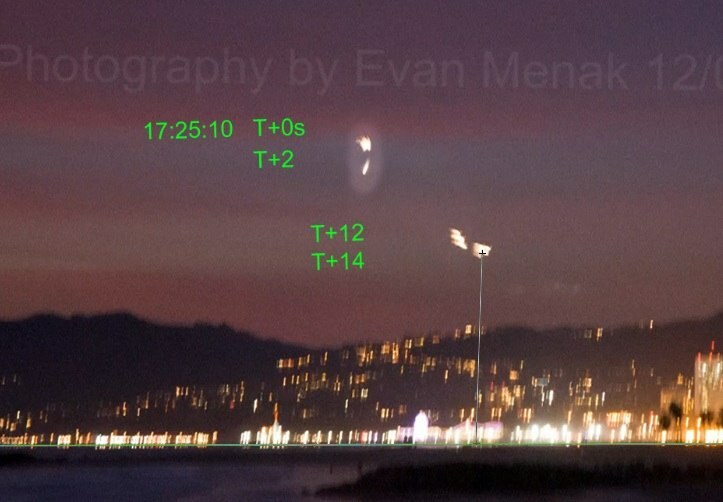 The Dec 8th incident was captured in still photos by Evan Menak. 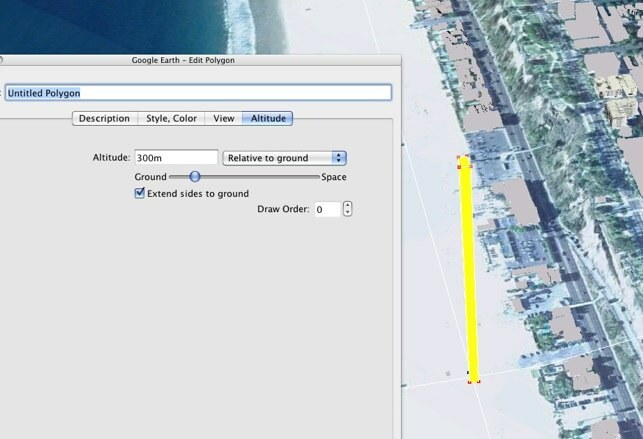 Using Google Earth I was able to match the viewpoint (Venice Pier) and assuming the object is also around the area of the beach at the end of Washington avenue, then I added a polygon to estimate the height. This one came out at 1400 feet. Overlaying all four shots and measuring the distance falled and the time stamps of the photos gives us an approximate speed of the object. It falls around 500 feet in 14 seconds, so about 36 feet/second. It travels about the same apparent distance inland. 36 f/s is about 25 mph. The winds at that time were around 5 mph from the west. That would seem to rule out a parachute rocket flare, and indicate something more aerodynamic. So we call tell pretty accurately WHERE the objects are. 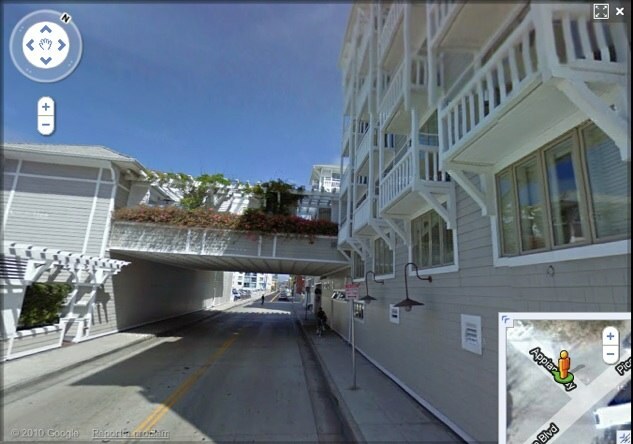 In both cases they are approximately over the shoreline, opposite the California Incline in Santa Monica, and between 1000 and 2000 feet in the air. Something (flare-like) descending via small parachute. Something that looks very similar is skydivers with flares. I don’t think that’s likely as people would have been able to see the parachutists land on the beach. It’s also kind of busy airspace to be parachuting in, and would have needed special permission. It would have to be someone doing it on the sly, like base jumpers do. That area of the beach is not that busy around dusk, it’s big and empty. 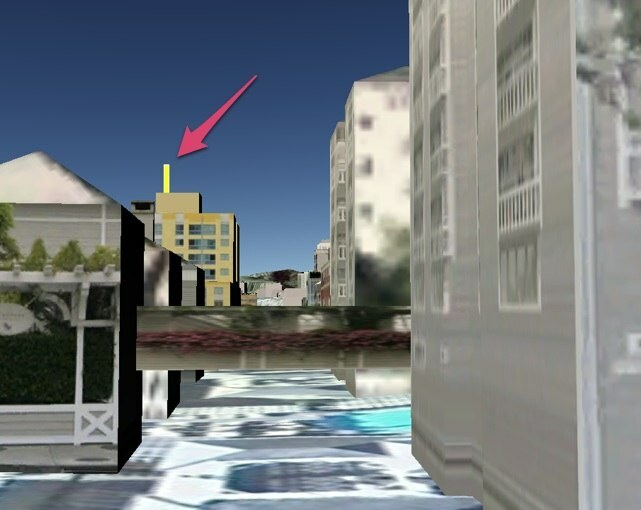 There are a few houses along the front, often on short term rentals, so it’s a fairly good location for someone to launch something fun into the air, and see what happens. Maybe it was even a deliberate attempt at a UFO hoax, or maybe just someone having fun. It’s quite possible that several people saw it and were close enough to see what it was. Anyone? 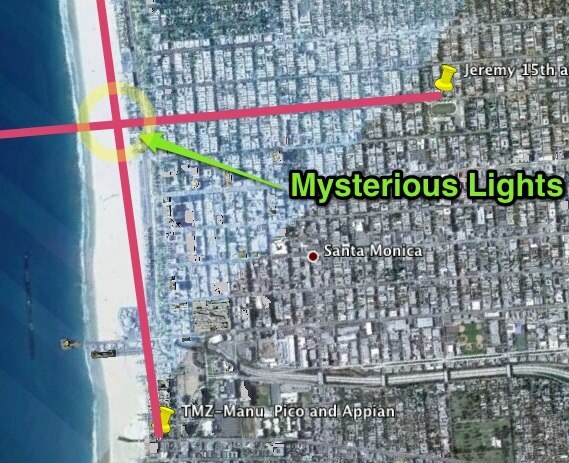 One point to consider, that’s the route that planes take from Santa Monica airport. Small planes will be around 2000-3000 feet when they pass over that spot. Maybe some prankster dropped something out of a plane, then seeing the reaction they did it again the next week. This video is bad, but the comments are interesting as they seem generic eyewitnesses. lastly- they do have several options out there for installing lights inside an R/C aircraft. If you cover the aircraft with transparent covering the whole thing would be lit up. The problem is you could never fly it to 1000 agl. Yeah, this is some sort of a constructed device. Maybe someone bought off a load of flares well beyond their “best” date ? Throwing a few polygons into GE, it looks like it’s about 1000 feet high. It’s hard to tell without duplicating the exact position and focal length of the cameras. The camera also moves around a lot. What about parachuters? That would explain witnesses’ “shooting star first, then slowed down” and the subsequent movements. And you can see “trailing sparks”. The high lateral speeds in the first event (Dec. 1) may have been achieved with wingsuits. There are reports of a night jump with wing suit and flares at this year’s “Burning Man”, but I can’t watch the video in my country because it “contains content from UMG”, whoever that is. The second event (Dec. 8) looks more like a “plain” jump with no wingsuit, with a straight free-fall phase. The smiley magic has touched the “8” and the “)”. That’s December 8th of course. I’m sold on the parachuter theory. Some pranksters, targeting a deserted stretch of beach, probably without an official permission. If so, it will probably not happen again, now that local news outlets took some notice. See- that SMDP article is exactly why there needs to be an independent consultation board of professionals established. The article is fine until the last line when he references the earlier sightings. 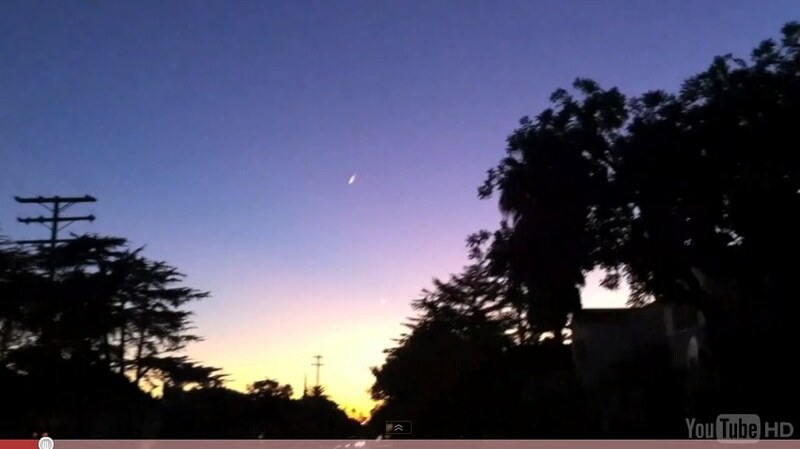 He stated that neither the California sighting nor the Manhattan sighting had been identified by authorites. I believe the Manhattan sighting was confirmed to be just a bunch of shiny balloons and this site has confirmed the origin of the California trail. He just took advantage of some half-truths to make his article sound better. I doubt it was a person in a parachute. It’s not exactly a deserted stretch of beach, it’s just a very wide beach (about 600 feet of sand), and would be fairly empty at that time of day in December. It’s a good landing spot, or a spot to launch a homemade rocket or an RC aircraft from. However it’s right next to a busy road, and in full view of hundreds of people in the houses on the beach and up on Ocean Avenue. I’ve flown over that spot many times. 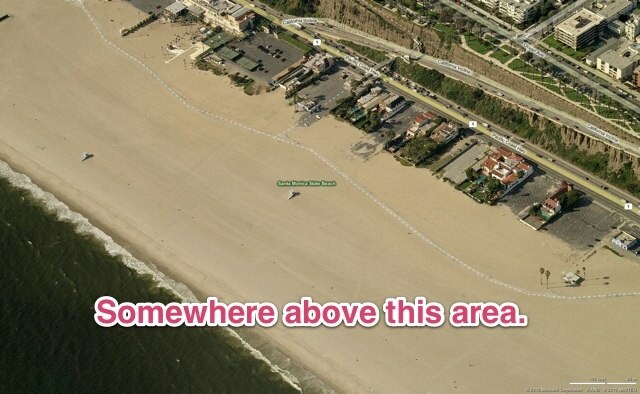 A large percentage of the traffic leaving Santa Monica airport goes north along the shoreline over that beach. I’ve also run along the beach path there, so I know exactly what it’s like. It’s just outside SMO class D airspace, but very much on the SMO tower radar. It’s also squarely under the 5000-10000ft LAX class B. There’s not a lot of room to maneuver round there. Basically if it was someone jumping out of a plane, then people would have been able to see the parachute, and that’s what would have been reported. It would also be rather risky to do without ATC permission, especially twice. I think it’s something smaller than a person with a parachute. I’m going with kite with some sort of flares. Just opinion, of course. 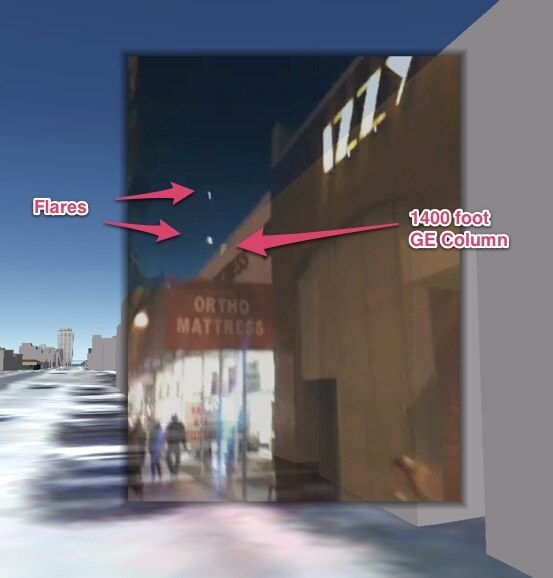 I used the Evan Menak photos of the similar Dec 8th incident to estimate the altitude at 1400 feet. That seems to make a kite unlikely – how high do they go? Interesting UFO-like kites out there though. I googled how high can a kite fly and found this from a kite flier. There are quite a few variables. I guess if you have the right conditions, anything is possible. Can someone confirm that the tail is never any longer through the whole video? The more I look at it the more I’m convinced that it’s a mylar tail/streamer catching some rays. It’s a cool effect. The diving motion is consistent with a kite also. Whatever it is, I want one…and maybe I’ll be able to get more people to look up more than once in a while…instead of staring at their shoes. I’m leaning more toward something launched than flown. I just can’t imagine an R/C plane going 1000 to 1400 feet high. It’s getting close to new years. Isn’t it possible that this is something to do with fireworks? Fireworks sounds plausible, but they are illegal here in SoCal. Of course that’s not going to stop everyone. People still let them off every year, even openly in the streets. well, reading the forum there I must admit that I’m both a little suprised and a little sceptical. I would suspect that those casio watches 1) are not compensating for current altimeter setting and 2) are reading MSL regardless of setting. So if it happened to be a day where the local altimeter setting was very high and they were starting out at 500 feet msl there would be quite a discrepency. Then again- I could be completely wrong and those altitudes are completely attainable. As both an RC pilot and kite flyer I think the motion more closely resembles a kite with a remotely triggered flare. The second light below it seems to be attached to the same tether. 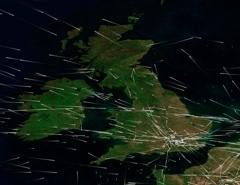 Do you have a wind direction forecast for that time of day? An RC aircraft would be tricky for a pilot to see at such altitude at dusk without navigation lights or an FPV (first person view) telemetry system. A lack of adequate wind may rule out kite but the wind direction may give the best clues to discern between kite or model. Wind in Santa Monica is fairly consistently off the ocean, from the west or thereabout, 5-10 mph. 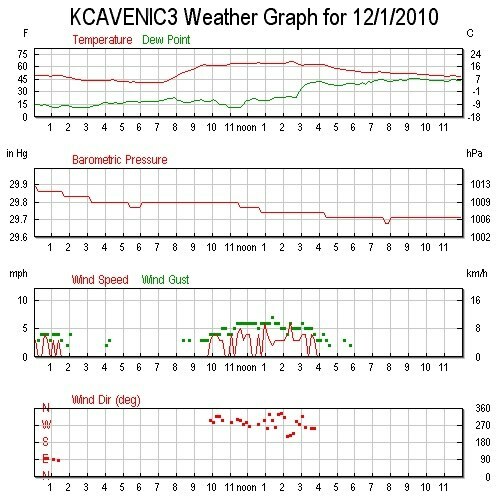 Indicates that it was dying down after 5pm on Dec 1st, just gusting under 5. So probably not good kite weather. Some kid fires a couple of parachute rocket flares. Or maybe the coastguards or lifeguards were testing? Apparently people make them at home. Sounds dangerous, but would explain what happened. So probably not good kite weather. I’m thinkin’ they’re probably low altitude rockets fired from a Mongolian submarine. I bet you think that’s clever?? Interesting the parachute flare in this video has a swinging pendulum motion that perhaps could produce an extended direction changing trail similar to the Dec 1 video if viewed at night. Longer tether, slower pendulum action. A parafoil chute rather than a circular chute would give an added forward motion and tend to extend the trail somewhat. Were there any reports of the flare witnessed going up or just coming down? Interesting. But I don’t think their rockets can reach our west coast from there ;-). Side note: Back in ’08 while trekking in western Mongolia I passed by a monument to one of their presidents who climbed Khuiten, the highest peak in that country. Must be a macho thing. O.K., the missing (big) parachutes are a handicap for the skydiver theory, at least for Dec. 1st where there is still some daylight. But the commercial parachute flares shown in the videos are obviously not leaving significant trails. I’m still convinced that we are seeing magnesium torches like the ones used by jumpers. As you can see in the trackback I tranlated this article for my blog. Thank you. Very interesting and elaborated. One question, don’t you think it is a coincidence that both the 1st and the 8th sights were the same weekday and at the same hour? Lets see if it happens again tomorrow. Fantastic work Uncinus and team! JFDee gets the prize I think on this one. Yeah. I was against the parachute theory, as I figured people would have seen it. But it turned out people did. They were just rich country-club folk who don’t read my blog!!! I think it’s still amazing how you can not see the parachutes in any of the Dec. 1st videos. A trick of the fading daylight? Cell phone camera peculiarities? I think it’s a combination of fading light and the fact that the flares probably optically blank out the chutes. I imagine if the flares were not there it would have been two dark smudges descending instead. 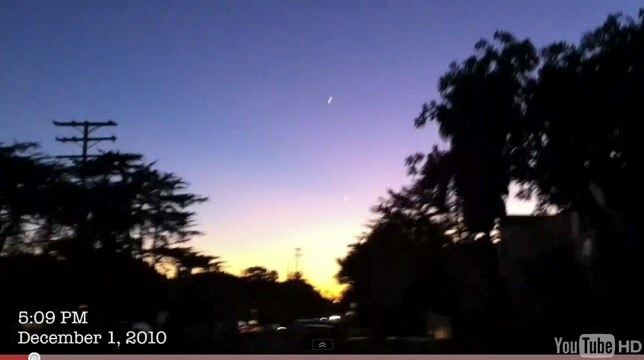 The video was taken from 1.2 miles away with an iPhone. 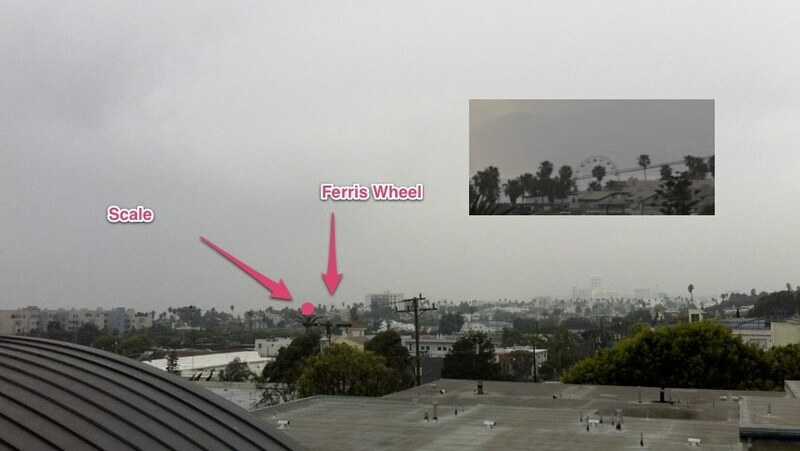 The ferris wheel is 85 feet wide. That scale circle I drew is a bit bigger, so 100 feet wide. A parachute canopy is maybe 20 fet wide? And viewed end on. In the dark. The flare is very bright, so that’s all the camera sees. It makes it seem bigger than it is, and would obscure anything you can see of the canopy. Their parachutes are tiny, maybe 6ftx15ft. Probably less than a pixel wide most of the time. And a dull white color. Note the flare on the ankle. I live in Florida. I have watched a couple of dozen Shuttle launches and rocket launches. THIS WAS A ROCKET LAUNCH. 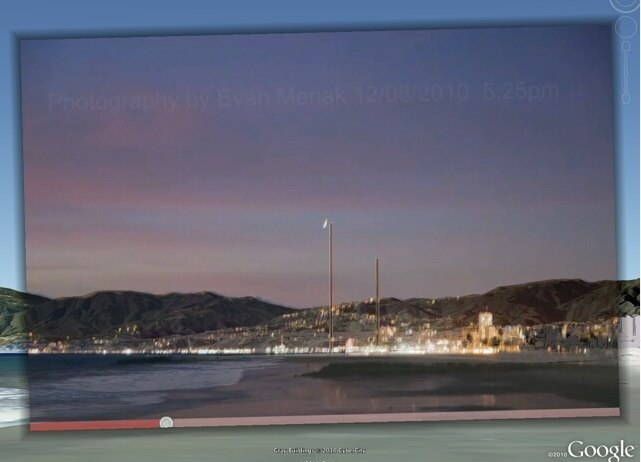 You can see the rocket fire at the tip in several frames. Whether it was a missle, I don’t know; but why would the military withhold that it was a rcoket launch, at least? You don’t think that the 10,000 people in Catalina would have noticed the Space Shuttle taking off nearby? [Edit] And you seem to be in the wrong thread.